Many people living in group homes and attending adult day services need a mealtime profile. Some people with disabilities have difficulties getting food and drink to their mouth, chewing, or swallowing. Some people cough – this may be an indication that food is going the wrong way and the person is at risk of choking or drink going towards their lungs. 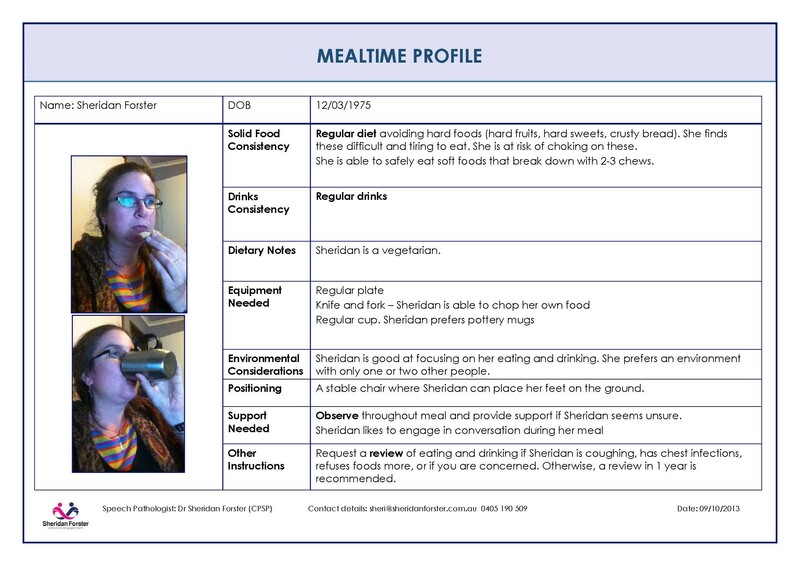 A mealtime profile is an instruction sheet on how to safely support an individual at mealtimes. It is based on an assessment of the person’s eating and drinking skills, completed by a speech pathologist. A mealtime profile outlines what sort of food and drink is safe for someone to eat and drink. It describes how to support the person and any special equipment that the person needs when eating and drinking. The person writing the mealtime profile must take into consideration the health and wellbeing of the person with a disability, their expression of preference or choice, and the needs of the people assisting during the meal. Disability support workers should follow the profile, as it is their guide for safe practice. If they or the person with a disability disagrees with the profile they should ask to have the profile reviewed and discuss their concerns. Not following the mealtime profile may put the person at unnecessary risk of choking or other eating and drinking incidents.